The researchers suggest that our faces evolved not only due to factors such as diet and climate, but possibly also to provide more opportunities for gesture and nonverbal communication—vital skills for establishing the large social networks which are believed to have helped Homo sapiens to survive. 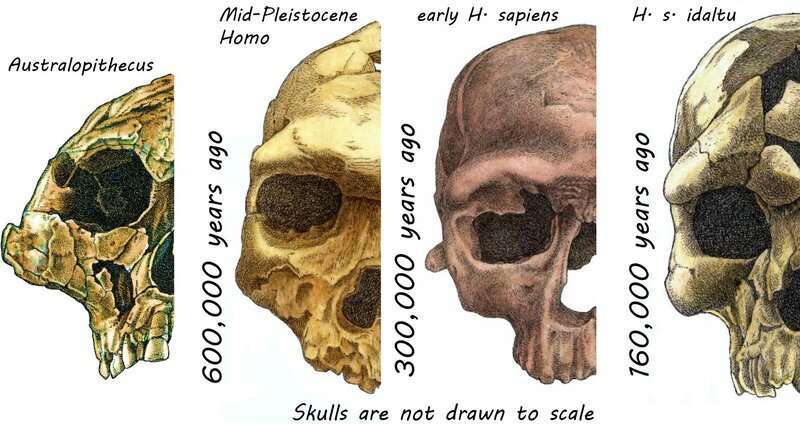 Instead of the pronounced brow ridge of other hominins, humans developed a smooth forehead with more visible, hairy eyebrows capable of a greater range of movement. This, alongside our faces becoming more slender, allows us to express a wide range of subtle emotions—including recognition and sympathy. This facial shrinking process has become particularly marked since the agricultural revolution, as we switched from being hunter gatherers to agriculturalists and then to living in cities—lifestyles that led to increasingly pre-processed foods and less physical effort. Not evolution. Domestication. Our domestication is written all over our faces. Humans systematically eliminated the attritive elements active in natural selection, condemning us to perpetual overpopulation. We congealed into tribes to secure and protect resources. Tribes with greater internal cohesion coupled with external animosity and aggression consistently prevailed in competition. Group selection replaced natural selection. The wholly artificial demands of tribal living in the context of technology required us to deny our animal urges in favor of those which benefitted the tribe. -The author doesnt distinguish between evolution and domestication. But the artificial environment wich created todays human is undeniable. I doubt that anyone could get any "ruder" then our modern American society's fixation with ignoring the genetic mashup of our beloved "Peculiar Institution"? Changes in jaw & bone structure are much more influenced by nutrition & caloric intake than anything else. Especially during pregnancy. Dental care & fluoride in public water & immunizations & birth control. I mention skull shapes separately except for deliberate skill deformation practices. Usually the causes were unskilled birthing practices, damaging the newborn. Violence against pregnant women as well as accidents. With plenty of opportunities for accumulative causes. Wearing shoes cut down to getting hookworm. While increasing the chances for stumbling & falling down. I think I am a good example of the physiological effects combing genes & diet. I bear a strong family resemblance to my Father & paternal Grandfather. & from old photos, similar to their progenitors. Except for three items. My size & weight is above normal for my Father's side of my genes including modern cousins. At my advanced age, I still have a full, lush head of hair. & if I had any less melanin. I'd be am Albino! The first was a better than average diet the last couple of generations. Than normal for an old-line impoverished Hillbilly family. On a controlled diet, I still probably consume twice the calories of my great-grandfathers. I acquired my height & head of hair from my Mother's Father. Who was a big Dutch Seaman. My constant sunburn is courtesy of my Mother's Mother. A Karelian-Finn peasant, sold into America. They didn't mention the whites of our eyes, also different from other primates, and, useful for communication (think of hunters, giving direction silently to each other, simply by looking at something, the whites tell us where they are looking...). No mention of the latest evolution; plastic surgery, and that hideous expression of perpetual surprise. Then again, this study is about the human face and most of those end up looking like completely different species. Not evolution. Domestication. ... Group selection replaced natural selection. Of course it is evolution. The paper title says so, and if they have looked 4+ million years into the past (or even 2 generations genetically, in the latest observations of evolution in modern populations) they have looked at trait evolution. Domestication is evolution, already Darwin knew that. And *we* know, after decades of observation, that "group selection" is neither expected - since gene selection is selfish - nor observed. I note that you have peddled this - in all honesty - crap before, still without even trying to support your claims with valid references. You even try to wave away the reference that tests your ideas as erroneous! Do you mean the article, or the paper? Since they - presumably - looked at fossilized traits, maybe they could not tell anything on that. The use of the Price equation to support group selection was challenged by van Veelen in 2012, arguing that it is based on invalid mathematical assumptions. Richard Dawkins and other advocates of the gene-centered view of evolution remain unconvinced about group selection. In particular, Dawkins suggests that group selection fails to make an appropriate distinction between replicators and vehicles. The psychologist Steven Pinker concluded that "group selection has no useful role to play in psychology or social science", since it "is not a precise implementation of the theory of natural selection, as it is, say, in genetic algorithms or artificial life simulations. Instead it is a loose metaphor, more like the struggle among kinds of tires or telephones." ... These reasons explain why only a few biologists, like [David Sloan] Wilson and E. O. Wilson (no relation), advocate group selection as the evolutionary source of cooperation."" In contrast, the gene-centered view of evolution worked out by biologists like W. D. Hamilton, Robert Trivers, and John Maynard Smith, and popularized by Richard Dawkins, has been immensely fruitful. So if group selection is so intellectually and scientifically unproductive, why do we hear so much about it? I think there are two reasons. With all that money and all those megaphones behind it, the idea of group selection persists in the public mind while slowly dying in the scientific community. Yes, it's dying, but it refuses to lie down." But I've always provided valid refs. You dont return to the threads where I present them in response to your criticism. And like I say I dont think you appreciate the uniqueness of the human species. Group selection among tribes is entirely different from whatever it might be in nature. So your refs from evolutionary academies do not apply. Academies CANNOT and will not entertain theories that threaten the existence of their institutions. But it is undeniable, when for instance celtic tribes were annihilated and extincted by Germanic tribes in central europe, that this is in fact group selection at work. And that this sort of group selection has been at work since protohumans began using weapons against their enemies of other species as well as their own. Like I say, there is abundant evidence. The article above offers valid evidence of very unnatural domestication, the result of group selection among weapon-wielding tribes, and it needs to be interpreted as such. The rapidity for instance at which our adaptions progressed can only be explained by group selection - tribes with unique physiological, cultural, or technological advantages attacking and obliterating tribes without them. Tribalism has no time for natural evolution. Islam spread so rapidly across northern africa not because believers had sharper claws. They had a superior social system which enabled them to replace more primitive ones. And they acted as a group - a TRIBE - not as individuals, emulating the 12 tribes of Israel in their quest to rid the holy land of unworthy tribes. An allegory of ALL of human history. And again, this process has been with us throughout our existence. It has made us human. See the above article. "We live in a time of tribes. Not of ideologies, parties, groups, or beliefs—these don't convey the same impregnability of political fortifications, or the yawning chasms between them. American politics today requires a word as primal as "tribe" to get at the blind allegiances and huge passions of partisan affiliation. Tribes demand loyalty, and in return they confer the security of belonging. They're badges of identity, not of thought. In a way, they make thinking unnecessary, because they do it for you, and may punish you if you try to do it for yourself. To get along without a tribe makes you a fool. To give an inch to the other tribe makes you a sucker." "More in Common found that "tribal membership predicts differences in Americans' views on various political issues better than demographic, ideological, and partisan groupings."" "Everything in American politics today entrenches tribalism: our winner-take-all elections, the dehumanizing commentary on cable news and social media, the people we choose to talk to and live among." "The trends are not new, but they've dramatically accelerated and intensified under a President who rules by humiliation because he lives in fear of being humiliated." -the author presents an extremely tribal message. It either demonstrates just how blind our tribal tendencies can make us, or it reveals how calculating and deceptive the progressive media has become in presenting its own tribal message as fact. Or more likely, this is a tribalist who willingly accepts the mandate from his leaders to attack at all costs. Tribalism is a universal biological phenomenon in humans. Blaming it on the opposition is an expected tactic. Darwin was unwilling to equate us with domesticated animals, even though he described the process. Heres evidence Ive previously posted. "To identify signs of a self-domestication process in humans, researchers made a list of genes associated with domestication features in humans, out of the comparison with the genome in Neanderthals and Denisovans, extinct human species. Then, they compared this list to the genome from some domesticated animals and their wild relatives, for instance, dogs compared to wolves, and cattle compared to wisents. "Results showed that this overlap was only relevant between domesticated species and humans. "Those modern humans' selected genes under selection may prove central to a relevant process of domestication, given that these interactions may provide significant data on relevant phenotypic traits," said Boeckx." "group selection" is a euphemism for racial bigotry & misogyny. The best example of that is the horrors inflicted on racehorses by the abusive usage of the Official Stud Book. Another means of determining the fallacious belief in group selection? Name me a descendant , to the last couple of generations. Of a famous historical person. Who has achieved anywhere near the fame & influence of their progenitor. W Buckley or WJ Bryan? A Rand or HL Menecken? When we speak of racists, bigots & misogynists? A pragmatic observation of their base inferiority & lack of moral character? Boasting of being descended from dinosaurs."